This superior table is for those who have a taste for style and refined objects. It has a most distinguished cabinet outline, graceful but solid slanting feet, and comes in beautiful soft new colours. 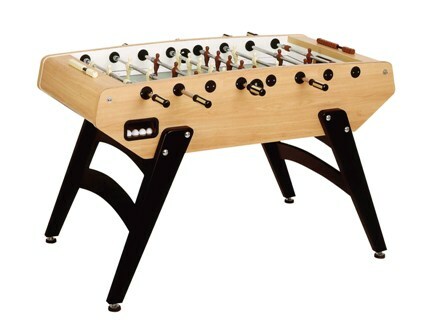 The G-5000 stands out from all the other home line tables thanks to attention to details such as the wood-inlaid plastic handles for sure grip, the leg levellers and the sanded glass playing field. The cabinet is manufactured in high quality multi-layer plastic laminate plywood that is 30mm (1 1/4") thick. The legs are made of finely laquered beech wood and inclined for better stability. Each leg has an adjustable leveller for a perfectly pitched playfield. High stress resistance telescopic safety bars in chromium plated anti-rust steel. Unbreakable moplen players moulded directly onto the bars. Colour: Ivory/brown. Nylon bushes and steel ball bearings guarantee high speed action, smoother play and reduced wear and tear. Wooden inserts in plastic handles reduce persperation and improve grip. The playfield comes with a 5mm tempered sanded glass pitch as standard. A ball pocket on each cabinet side allows easy ball retrieval. Plastic score counter with ivory and brown cubes. All surfaces including the playfield are coated ini washable materials ensuring easy cleaning. No other maintenance is nesessary. G-5000 is guaranteed for 12 months from date of purchase against manufacturing defects.